Engraving / Full Colour Graphics! Where is the best place to put your company logo on a shirt? At Unique Embroidery & Promotions we have a few tips and suggestions. After all, logo placement is a huge part of our business. There are five main locations to consider: left chest, right chest, back, sleeve, and the Yoke - below the collar on the back. At Unique Embroidery & Promotions we strive to provide our clients with a wide range of well-known clothing brands that exemplify the company's focus on delivering superior products. Unique Embroidery is proud to be a supplier of Coal Harbour Apparel, a brand that has become well known as a provider of quality clothing. Every business owner knows the importance of analyzing the advertising effectiveness of your promotional goods. One good way to do that is to take advantage of the considerable amount of research that has already been done for you. 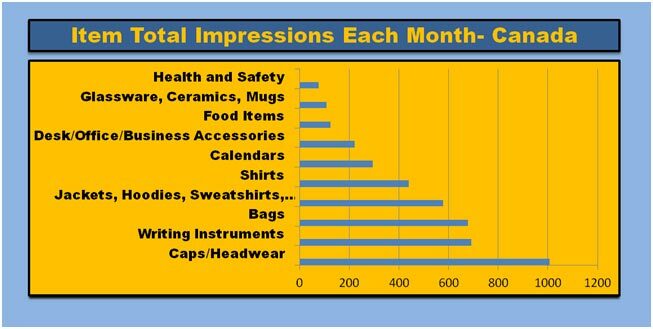 At Unique Embroidery & Promotions we can help guide you to the most effective products for your specific marketing plan by using information like that provided in the graphs.